I love sandwiches. Especially easy ones. 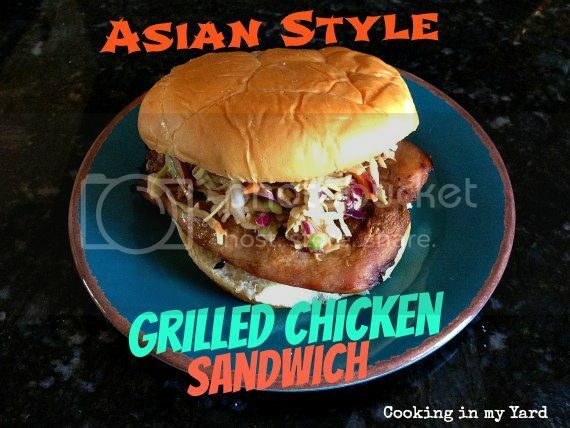 And this Asian style grilled chicken sandwich was pretty easy to make. The best part about it was I made it from ingredients I already had on hand. No shopping required! At least not that day. Since I was grilling it over a hot fire, I figured I would butterfly the chicken breasts first. Then they are a uniform thickness for cooking. Then I put them in a Ziploc bag with equal parts pineapple juice and soy sauce. Squeeze most of the air out of the bag, seal it up, and then put it in the fridge for at least a half hour, but I had it in there for about 2 hours. 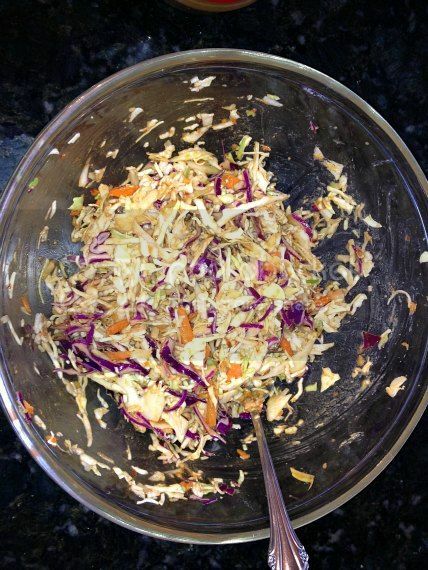 While that was marinating I mixed up the Asian style coleslaw. Grilled chicken, burgers, even pulled pork sandwiches are always better with some kind of slaw on top. The ingredients for this one was pretty basic. Here is a shot with the ready made coleslaw added. This was a very simple meal. Which is good because things have been crazy around here after Hurricane Sandy came through. And things are even harder because I have a cast on my wrist for at least a few more weeks. But the good thing is I am now learning to do everything left-handed. There’s gotta be something positive in that, right? Butterfly the chicken breasts, unless you are using thin cut chicken breasts. 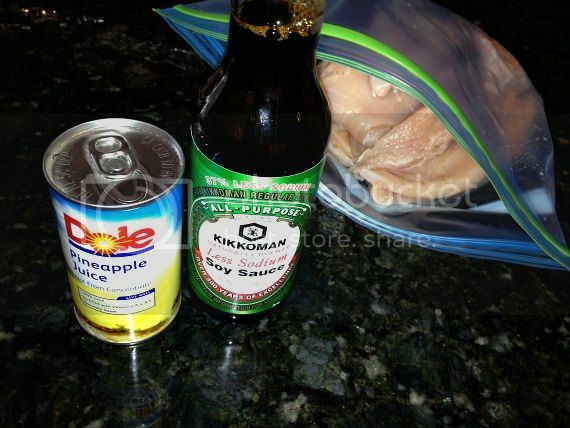 Put chicken breasts into Ziploc bag with 6 oz of pineapple juice and 6 oz of soy sauce. squeeze most of the air out of the bag, seal, and put in the fridge to marinate. 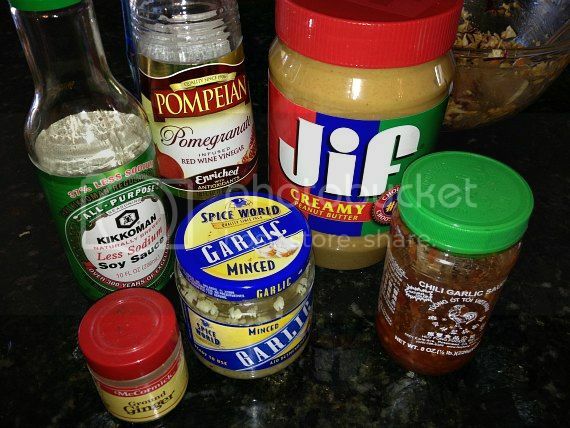 Mix remaining ingredients (except sandwich buns) in a med-large bowl. Cover and put in fridge until needed. Put chicken breasts on grill for 2-3 minutes per side, depending on thickness. Remove when cooked. 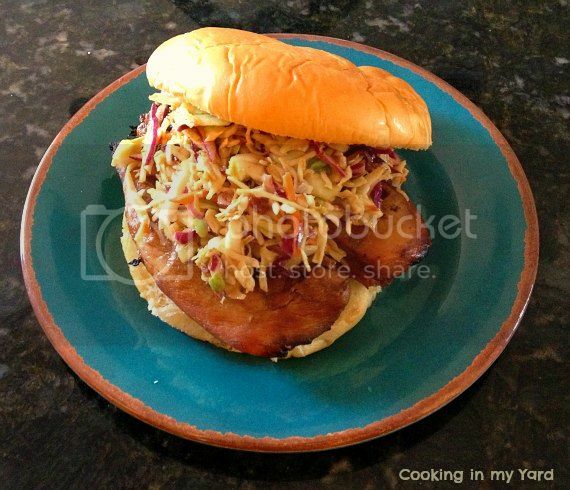 put grilled chicken onto sandwich bun, add some coleslaw, then enjoy!